Ever since creative kingpin Tom Ford stepped down from his role as Creative Director of Gucci in 2004, the international fragrance community felt they were witnessing the slow death of the brand's perfume portfolio. Ford's tireless efforts in creating new, unconventional perfumes for Gucci went begging once current Creative Director Frida Giannini stepped into the limelight and - over the ensuing years - retired every last one of them. With the rolling launch of a number of commercial Gucci scents in the years that followed, it was clear a new fragrant era for the brand was clearly afoot, but the hardline 'perfumisti' were having none of it. They were not warming to Giannini's olfactory oeuvre. In a fickle market where companies are churning out perfumes at an alarming rate, major fashion brands are now looking to capitalise on the modern predilection for niche fragrances and olfactory exclusivity. Hermès with their Hermessence line, and Chanel and their Les Exclusifs are arguably the forerunners in this market, with unique perfumes and perfumed-products offered solely in their boutiques. 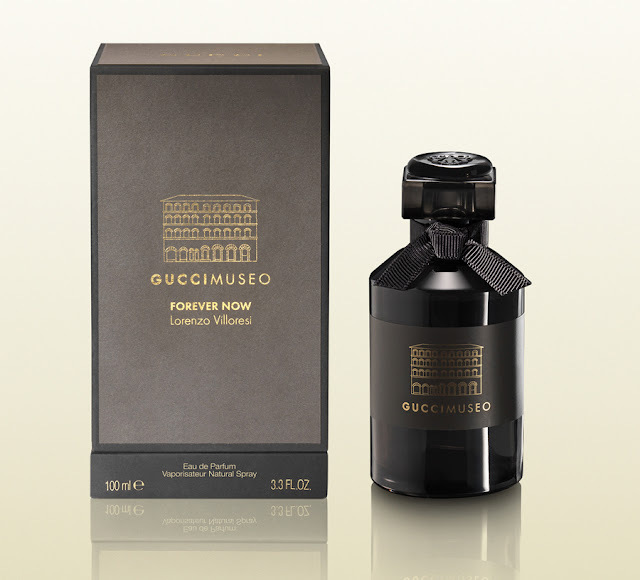 In 2013, Gucci have followed suit with a comparable concept, launching the first of their Gucci Museo perfumes, offered exclusively at the Gucci Museo on the Piazza della Signoria in Florence, and at Gucci boutiques worldwide. This week I had the opportunity to visit the Perth boutique and experience Forever Now, a collaboration between Giannini and acclaimed Florentine perfumer, Lorenzo Villoresi. The name Forever Now is somewhat of a contradiction of terms, however, I suspect - given that Gucci celebrated 90 years of history in 2011 - that it is a reference to the timeless tradition that still lives on today. The perfume itself, is presented in a lovely, weighty smoked glass flacon embellished with a black-brown ribbon and monogrammed cap. 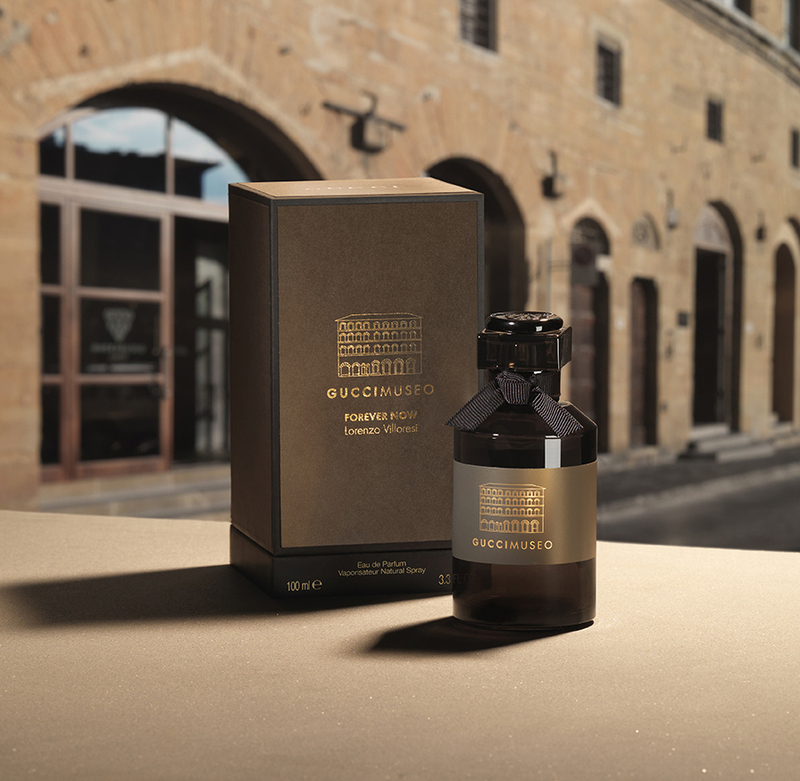 The packaging is presented in tidy grey-brown with the Museum facade and logo gilded in gold. As for the scent - it opens with a sparkle of citrus that dances over a piquant black pepper note. It feels quite breezy and transparent, and then a bouquet of hushed florals emerge: rose, ylang ylang, dusky green lavender and powdery iris. There is also a semi-sweet sprinkling of nutmeg which lends warmth and light spice to the composition. Further in, a beautiful slightly-bitter leather note shifts forward. The marriage of the powdery iris and this velvety suede suddenly transforms this eau de parfum... it's former, slightly diaphanous quality unexpectedly turns opaque. A delicate soapiness swells on the air and spreads laterally across skin... it feels dense and substantial. It is not a cloying soapiness... rather a beautifully fragrant creamy lather, with leather, vetiver and earthy patchouli at its core. The lingering trail is of light, ambery spices, and clean musks. This perfume lasted well over 10 hours on my skin. Forever Now does feel decidedly Florentine, and with Villoresi's expertise and DNA present, I find it lives up to - and exceeds - my expectations. If it is Giannini's intention to bring on board an acclaimed nose to consult with on potential future releases from the Gucci Museo stable, then there is indeed a glimmer of hope for an olfactory renaissance for the brand. Perfumisti, you can now breathe out. I haven't been this excited by a Gucci perfume launch, well... since the early noughties.